Browse > Home / Riflery / Shooting Guns at Camp? Yikes! Shooting Guns at Camp? Yikes! 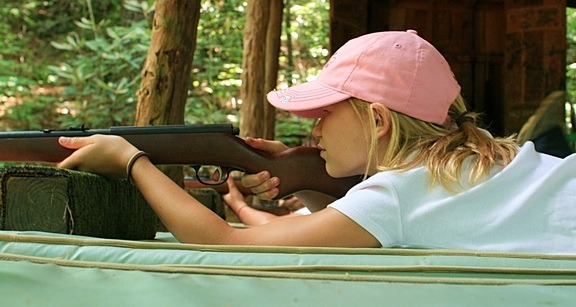 Sometimes parents are a little surprised to learn that the girls at camp learn to shoot rifles. We’ll sometimes hear, “Are those real guns?” They sure are! While our youngest girls will use “youth” rifles, everyone shoots real .22 caliber guns. This means the bullets are small 22/100ths of an inch in diameter. We also use the lowest power .22 ammunition, the “short” rimfire version. These are the perfect choice for target shooting, particularly on our youth range (25 meters or about 27 feet to the target). Shooting is of course completely controlled and supervised at camp. The guns and ammunition are always locked and stored separately. The riflery sport instructors are trained and NRA certified to operate a rifle range, and all of the campers are taught the proper safety protocols when they choose riflery for one of their activities. So yes, the guns and bullets are real, but we do everything we can to make sure it’s very safe.